The Central Visayas or Region VII is comprised of the provinces of Bohol, Cebu, Negros Oriental and Siquijor, and the cities of Cebu, Lapu-Lapu and Mandaue. Cebu City is the economic center. While in the region, you need to admire a world-famous view, meet one of the world’s smallest primates, hit the beach – in style, dive deep, pig out, face your fears, make some feathered friends and walk amongst legends. But there is more. Party like a local. Join in the festivities. Here are the top 4 colorful festivals in the region. The Sandugo Festival in the capital city of Tagbilaran celebrates a blood pact that was made between Spanish explorer Miguel López de Legazpi and Datu Sikatuna, Lord of the Bohol Island in 1565. These days, the festival is highlighted by street fairs, dances, sporting events, cultural events and more. On the list are shows, agricultural showcases and even a beauty contest. The festival is a time for historical displays and heritage exhibits aimed to describe what life has been on the island during the 16th century when the blood pact was made as well as a re-enactment of the event. Cebu remains an island of revelry. The Cebu City Tourism Commission and the Cebu Tourism Officers Association are working hand in hand with the Provincial Tourism Office and DOT Central Visayas to promote Cebu as it plays host to many crowd-drawing festivals. During the annual founding anniversary of the province every August, the provincial government organizes the Festival of Festivals, a grand event which bring together the more than 40 festivals in Cebu into one colorful display of traditions. 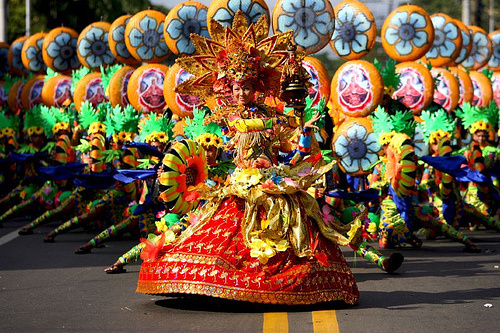 Sinulog Festival is so famous and takes center stage on the third week of January in honor of Señor Sto Niño de Cebu. Historical accounts reveal the image was given by the Portuguese Captain Ferdinand Magellan to the wife of Cebu Chieftain Raja Humabon for their pledge of allegiance to the King of Spain. This event is depicted in the Sinulog Festival. Negros Oriental is a province full of celebrations and events. Whenever you come, there’s always something for you to enjoy. It boasts of 24 fiestas each dedicated to their respective patron saints, and topping it off is the Buglasan Festival, the fiesta of the entire province which takes place every second week of October (October 11 -20). In the province’s capital of Dumaguete City, Buglasan is considered an annual Provincial Fiesta, and biggest culture and arts and tourism showcase. For ten spectacular days, entries from the 25 towns compete in exhibits and cultural shows all designed to steer to greater heights the local culture and the arts and tourism. The Festival of Festivals brings together the champion contingents of Negros Oriental festivals for a one-stop sampling of the variety of pervading traditions and advocacies. Be mesmerized by street dance and parade, pageants and fairs, booth exhibits, live band concerts, games and fireworks. Pasiugdang Sikihudnon Festival takes place every September 17 at the Provincial Capitol in the capital town of Siquijor. This is a cultural event during the island’s independence day celebration called Araw ng Siquijor. Considered as a festival of all festivals, Pasiugdang showcases the respective festivals of the six towns. There is also a presentation of the Solili Festival dance which depicts the marriage ritual traditionally organized by the natives of Siquijor. Explore spectacular destinations in the Philippines. Royal Brunei Airlines regularly flies from Dubai to Manila. Next to Manila, the Mactan-Cebu International Airport in Lapu-Lapu City is the second-busiest airport in the Philippines which offers international flights to major Asian hubs.